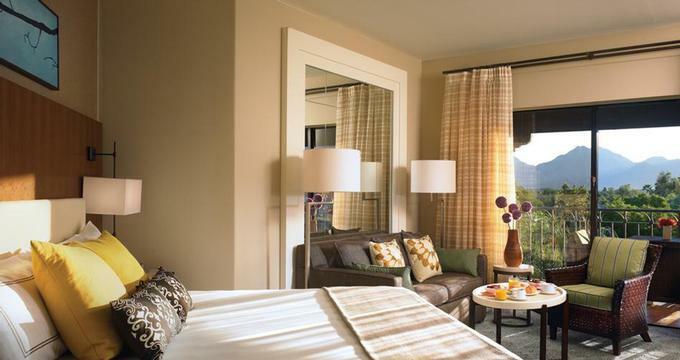 Relax in a luxurious desert setting at the Fairmont Scottsdale Princess resort in Scottsdale, Arizona. This iconic resort is famous for its fabulous spa, pools with waterslides for kids, and golf. The Willow Stream spa features a fitness center, open-air courtyards, a cascading waterfall, meditation gardens and a private roof-top oasis pool. Let your body detoxify in the eucalyptus steam room or under the warm, crisp desert sun. After a massage, relax and recharge outdoors next to one of the four pools. Resort guests can play golf on a number of nearby courses, including the The Tournament Players Club Stadium Course and The Tournament Players Club Desert Course. The Stadium Course is the home of the annual Professional Golf Association Tours Phoenix Open. Its green fairways are dramatically contrasted by the desert vegetation and breathtaking mountain views. Guests can also book tee times at Sunridge Canyon, Wildfire or the more forgiving Kierland Golf Course. The hotel hosts a number of tennis championships, including the annual Franklin Templeton Men's Tennis Classic and the State Farm Women's Tennis Championship. There are seven courts, all lit for night play. There are several unique programs for kids, depending on when you go. Guests can choose from 650 guestrooms, including 125 Casitas, decorated in graceful Southwestern style. All the rooms have a private terrace or balcony overlooking the resort grounds and the wide open landscape. Try one of the rooms with a fireplace for added warmth and ambiance during cool desert nights. There are many restaurants, each offering a distinct ambiance and cuisine. Marquesa, rated AAA 5 Diamond and Mobil 4 Star, is the resort's signature restaurant with Mediterranean cuisine. La Hacienda is North America's only AAA 4 Diamond and Mobil 4 Star Gourmet Mexican restaurant. There is also a Steak House, The Grill, featuring dry-aged beef, fresh fish and shellfish. The resort's main dining room, Las Ventanas, offers American comfort food and is decorated in southwestern style with glass walls and tile floors. Located near Phoenix, Arizona, the hotel offers warm desert climate, beautiful scenery and many recreational activities. In addition to spa and golf, guests can enjoy four heated swimming pools, two water slides, water volleyball, horseback riding, mountain biking, jeep tours and croquet. Phoenix and Scottsdale offer sightseeing and shopping. For example, Desert Botanical Gardens is a collection of desert plants from around the world. The concierge can also arrange desert jeep and hummer tours, hot air ballooning and mountain bike excursions. Because of high temperatures in the summer, the best times to go are fall, winter and spring. The resort is 20 miles from Phoenix Sky Harbor International Airport. Taxis and car rentals are available at the airport. Here is a great new luxury service to look forward to on your next stay at a Fairmont hotel: the company announced that it will offer complimentary local shuttle service in BMW 750i Sedan vehicles at all Fairmont properties in the United States. The program was first tested in Canada and was highly successful, hence the expansion to the United States. Take advantage of this service to play golf on a nearby course, go out to dinner or plan a shopping trip in a nearby town. This service is offered to Fairmont President's Club members. Membership is free and includes other benefits, such as complimentary high-speed and wireless internet, Fairmont Fit running gear and athletic apparel by Reebok, a members-only reservations line, as well as expedited check-in and check-out. Rates vary according to season, starting at $159 during the low season and at $479 during the high season. Be sure to check for spa and golf packages to save.